Here are the steps for using True Slide Resize. 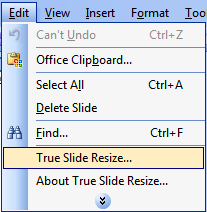 Use these after downloading and installing True Slide Resize on your machine. Open your presentation in Microsoft PowerPoint. 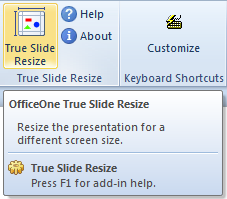 Your slides will now get resized by OfficeOne True Slide Resize. Note that the trial version resizes only the first 5 slides. The licensed version does not have such limitations. Click here to see the purchasing details.